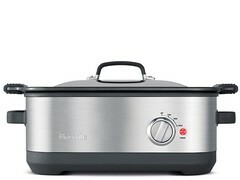 The Breville Slow Cooker™ — Slow cook meats and stews to perfection. Sear, sauté, and brown on the stove-top and finish slow without losing any depth of flavor or nutrients. Low setting for gentle, uniform heat to deepen rich flavors. High and Dual settings for better cuts of meat and dishes featuring vegetables and grains such as soups and stews. 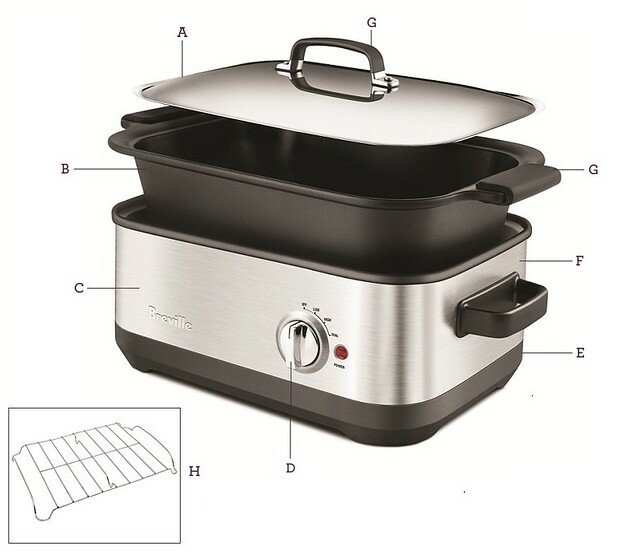 Cool-touch handles let you easily transfer from stove to cooker. A. Domed Stainless Steel Lid. B. 7 Liter Removable Die-Cast Pan with Easy Sear™. C. Wrap Around Element. D. Control Dial with Auto Setting. E. Removable Power Cord. F. Brushed Stainless Steel Housing. G. Silicone Handle Covers for the Removable Pan and Stainless Steel Lid. H. Stainless Steel Rack.